Random And Some: "Cowards die a thousand deaths, but the brave only die once"
"Cowards die a thousand deaths, but the brave only die once"
I don't want to oversell it, but Radcliffe's list of Best Novels is literally the best thing ever. Granted, I'm only about a tenth way through the whole thing, but I so very much liked The Grapes of Wrath, Their Eyes Were Watching God, A Clockwork Orange, The Great Gatsby and Slaughterhouse-Five that I have come to expect great things when getting to a book from their list. If there were more hours in a day, I would get started on To Kill A Mockinbird (No. 4), The Sound and the Fury (No. 10), A Portrait of the Artist as a Young Man (No. 14), Brave New World (No. 16), As I Lay Dying (No. 19), Finnegans Wake (No. 46), and The Fountainhead (No. 49) right now, but alas, they will remain untouched for a little while longer. 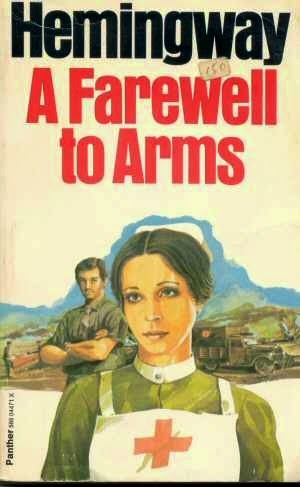 Luckily, I did manage to finally at least read A Farewell To Arms, Ernest Hemingway's 1929 best-seller. A Farewell To Arms takes place at the Italian Front during World War I and chronicles the life of American expatriate Frederic Henry, who serves as a Lieutenant/Tenente in the ambulance corps of the Italian Army. One fine evening, he is introduced to the lovely nurse Catherine Barkley by his oversexed comrade Rinaldi. When Frederic is wounded by a mortar shell, he is sent to a hospital in Milan, where he and Catherine spend the summer together and fall deeply in love. When Frederic is healed, he returns to his unit, but soon the Austrians break through the line in the Battle of Caporetto, forcing the Italians to retreat. Hemingway's oftentimes bizarre, semi-autobiographical first-person novel many times frustrated me. I generally found the book too one-sided and the characters too difficult to get invested in, and the story never really made me experience anything. Sure, Hemingway's writing is beautiful and explores the brutality of war and the torrid fate of star-crossed lovers, but overall, Papa Hemingway largely remained too stoic for my taste. Let It Goat is the G.A.O.A.T. NBA free agency is like Christmas!